Katrice Perkins/Daily Mining Gazette Baraga community members gather to discuss a possible solar project with UPSTART at the Baraga Area Schools library on Thursday. 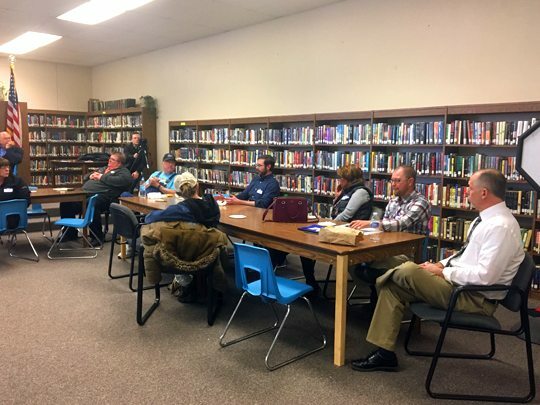 BARAGA — The Upper Peninsula Solar Technical Assistance and Resource Team (UPSTART), hosted a community forum Thursday to discuss a potential community solar project at the Baraga Area Schools Library. The village of Baraga council members were there to evaluate the feasibility of the solar project for its residential and business electric utility customers, as well as other community members. The purpose of the forum was to gauge community interest, address concerns and see how the project would look and work for the community. The forum was led by Michigan Technological University graduate student Emily Prehoda. She gave an overview of the project, cost estimates and answered questions as did other UPSTART members. The project lets interested parties buy a subscription or share through the village for $350-$450 per panel, and they will get the credit back on the bill. The price can be financed and the panels will be in one centralized spot. “What makes it nice is that you don’t have to put it on your roof and you don’t have to deal with the maintenance,” said Prehoda. The panel is said to make the owner $30 per year. Prehoda discussed the current solar project that is being worked out with the village of L’Anse. L’Anse’s estimates were used to show what the costs and returns would be for the Baraga area. According to L’Anse village manager Robert “Bob” LaFave, the project is close to being done. “We’ve got a little bit of due diligence left to do, but I feel pretty confident in the project,” said LaFave. UPSTART was awarded a $45,000 grant for the L’Anse project from the Michigan Department of Agricultural and Rural Development. The total cost for the project was estimated to be about $200,000. There was concern about the commitment of having the panels for 25-30 years. The panels, which are glass, are not permanent and would have to be discarded or possibly replaced after the time frame. The group might be doing a possible pre-subscription phase, to see who would be interested in getting panels. There will also be a community survey sent in a couple of weeks. For those who might want more information contact Prehoda at ewprehod@mtu.edu.